UNEXPECTED AND UNDENIABLE . . .Bailey Moore has an agenda: skiing in the Rockies, exploring castles in Europe, ballroom dancing in Argentina. Now that she has a second lease on life, she's determined not to miss a thing. What she doesn't realize is that item #1 comes with a six-foot-one ski god hot enough to melt a polar ice cap. She doesn't want to miss out on him either, but Hudson Kincaid isn't the type of guy to love and let go. And as gorgeous as Cedar Ridge is, she's not planning to stick around. 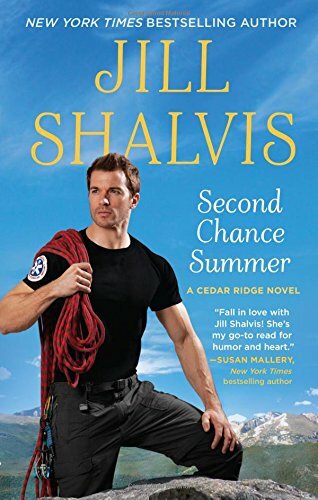 Cedar Ridge is fast becoming my favorite Jill Shalvis series. Set high in the Colorado Rockies, the series centers around the lives of the Kincaid siblings and the ski resort they run. Their lives have not been easy; three of the siblings are the results of extra-marital affairs their father had before he skipped town leaving all of them in a financial stranglehold and working day and night to save their beloved resort. Hud Kincaid, along with his twin brother, spent his childhood taking care of his mother and staying one step ahead of child protective services. The day he arrived in Cedar Ridge and met his legitimate half-siblings - and their caring mother - was the day he finally found a home. He loves his work as head of ski patrol at their resort, his part-time job as a police officer, and his family. He never wants to leave. He does his share of dating but is content to leave relationships to his family. Hud has some deep issues with putting his heart in another's keeping. His father abandoned them, his twin brother left town when they were eighteen and he hasn't heard from him since, and the mother who neglected them is now in a care facility and his responsibility. Hud's roots are sunk deep in Cedar Ridge. He shoulders too many responsibilities to even think about taking a day off, much less leaving town, but Bailey Moore is a whirlwind he never sees coming...and exactly what he needs. Bailey has spent the past ten years on the cusp of death, cocooned in cotton by her mother and ex-fiance. She never expected to be alive at this stage of her life, much less cancer-free and she plans to make the most of each and every day. She has a list, written in her darkest days, of all she wants to do. Skiing in the Rockies is on the list. So is painting a mural and traveling the world. Falling in love with Hud is not but sometimes fate gives us what we most need, even if we don't know it. My Kind of Wonderful is one of my favorite contemporary romances of this year. Filled with Shalvis's trademark humor, sass and sizzle, it also has an emotional depth that touched every emotion. Shalvis has brought these characters - the entire Kincaid family - to life in such a way that I'm sure if I traveled to Cedar Ridge - also brought to vivid life in these books - that they would all be there waiting to welcome me. If you're looking for a story that makes you laugh, cry, and cheer for the love, light, and family that triumphs over adversity, look no further than Jill Shalvis's My Kind of Wonderful. In My Kind of Wonderful, Bailey paints a mural at the Kincaid's ski resort, depicting each family member with a caricature that shows them at work or play, doing what they love most. How would you be depicted if someone painted a caricature of you? When the knock came at the door, Hudson had just gotten out of the shower. Wrapping a towel around his hips, he grabbed the money he’d left on the foyer entry table and pulled open the front door. But it wasn’t the pizza guy. Instead, Bailey stood there. She lifted her head slowly, her gaze taking in his body. She swallowed hard and stepped into him, setting her hands on his stomach. Head bent, she stared at her fingers on his bared skin, her brow furrowed in concentration. “Okay,” she said. “I’m having trouble finding words because I’ve never done this before.” She drew in a deep breath. “What I’m trying to say is that I want a one-night stand.” She met his gaze, clearly waiting for his reaction. Hell no. “I already told you that I want you. Now I’m going to show you.” He gave her a few beats to absorb that before he leaned in and kissed her, putting every ounce of his want and need into it. In answer, she moaned and wound her arms around him. Without breaking the kiss, he straightened and cupped the backs of her thighs, encouraging her to wrap her legs around his waist. And then he carried her to his suite. I don't read a lot of contemporary but I enjoy all of her books!! I've enjoyed most of her books but these Cedar Ridge books really speak to me. I loved Second Chance Summer , and I preordered both My Kind of Wonderful and Nobody But You, Characters are my prime consideration in investing in a series, and I am totally engaged by the Kincaid brothers. I did the same, Janga. I love these characters. I do hope she plans to write a book for Kenna too. I've been doing a lot of that hair tearing too, especially early this morning when the review I had written - and loved - for this book was accidentally deleted. By me. I had to re-write the entire thing quickly and couldn't remember what I had said the first time around. I was not a happy camper! Oh, PJ, how awful! I did that once with an assigned article. I confess that after an exhausting search hoping it was somewhere else on my computer, I cried a bit and indulged in some choice expletives (rare for me) before I started rewriting. I enjoy reading all of Jill's books. I'd be depicted reading. I have books and my kindle near me. I love Jill's books and her blog - they always make me smile. I read everything Jill Shalvis writes. Just love her humor. I guess my drawing would show me with a huge smile on my face surrounded by my grandkids. That's what love the most. I love all Jill's books and have to read both of these books. Thanks for excerpts. I'd probably be curled up in a chair reading. I've enjoyed Jill's books for at least 20 years, going back to her category days. Love the chemistry and affection between her characters, laughter is usually present too. My picture would show me walking, pushing a stroller while reading a book to my two grandchildren. I would be depicted with a hockey stick in one hand and a book in the other :) I'm a huge fan of Jill Shalvis and her books! Can't wait to read this one.